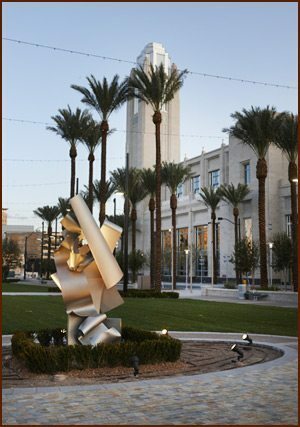 The Smith Center for the Performing Arts is committed to art of every medium, from stage shows to sculptures. Throughout our five acre campus we feature extraordinary works of art, from commissioned pieces to exhibits on loan from museums and private collectors. The Smith Center is proud to provide the community an environment with aesthetics to match the world-class music, dance, and theater hosted upon our stages, whether it is to take in a performance or just to have a beautiful place to spend an afternoon or evening in Symphony Park.